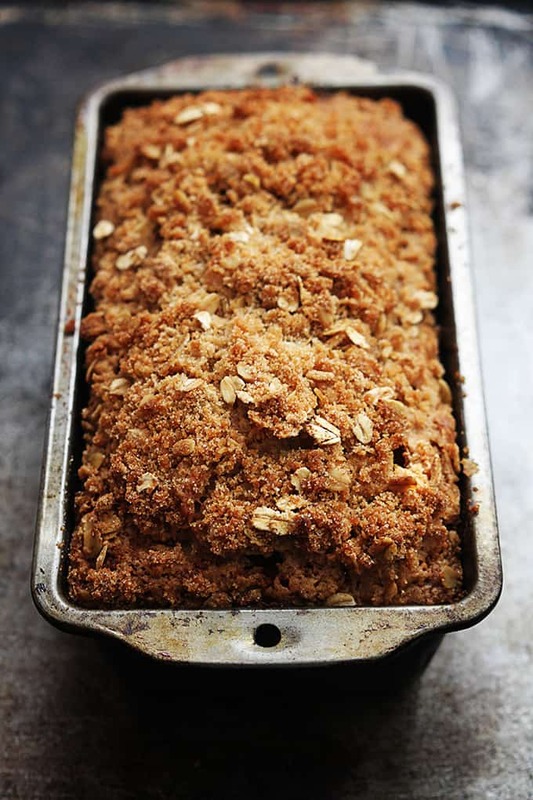 Soft and moist pumpkin bread topped with cinnamon oat streusel. This takes a seasonal classic to a whole new level! I told myself I wasn’t going to post any more pumpkin recipes for the rest of the season. But you guys, it’s pumpkin bread. With cinnamon streusel. So… ya know?? Sadly, it didn’t occur until after I made and photographed this recipe that it would have been 10x better if I’d added chocolate chips. Actually it might have never occurred to me if my husband hadn’t stared at his slice with a look of longing that I realized what he was so upset about. That man wants chocolate in/on/with everything I swear. So make it with or without chocolate chips, it’s up to you – either way it’s totally delish and definitely a must-make this season! 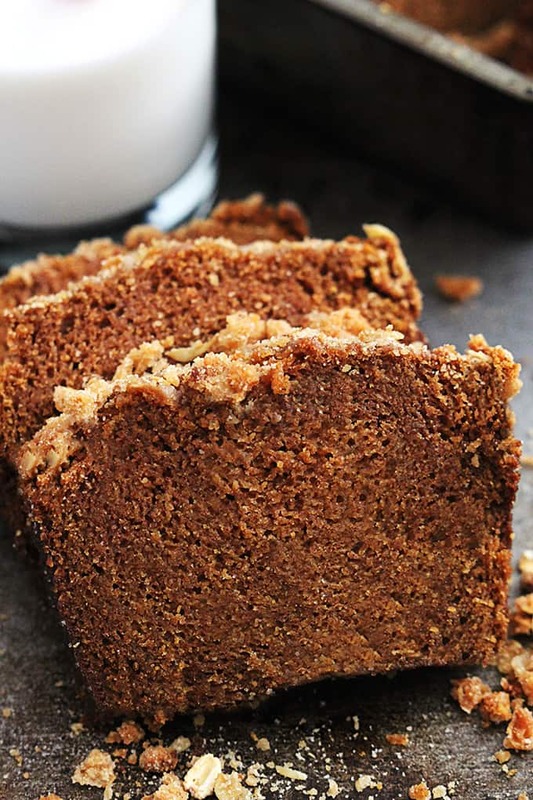 Soft and moist pumpkin bread topped with cinnamon oat streusel. Preheat oven to 350 and grease a 9x5 inch bread pan. In a medium bowl whisk together flour, baking soda, cinnamon, pumpkin spice, and salt. In a large bowl mix together eggs, sugar, brown sugar, pumpkin puree, vegetable oil, and milk until smooth. Add dry ingredients to wet ingredients and stir until combined. Pour into prepared bread pan (fill 3/4 full). In another bowl combine streusel ingredients and use a pastry cutter (or fork, or your fingers) to mash ingredients together until crumbly. Sprinkle mixture over batter in bread pan. Bake for 60-65 minutes until an inserted toothpick comes out mostly clean. Allow to cool completely before removing from pan and slicing. Store in airtight container. 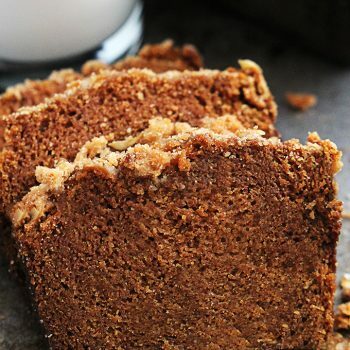 Bread Recipes that are to die for!! How much chocolate chips would you recommend adding? Thank you very much for this amazing recipe. My daughters are pumpkin freaks so I’ll make this again on Thansgiving morning when they are in town. I think I’ll add chips to one and pecans ‘in’ the other. PS Thank you for having the bottom advertisement removed from you page. This looks so insanely light and fluffy! This looks delicious, btw. Love the photos!! 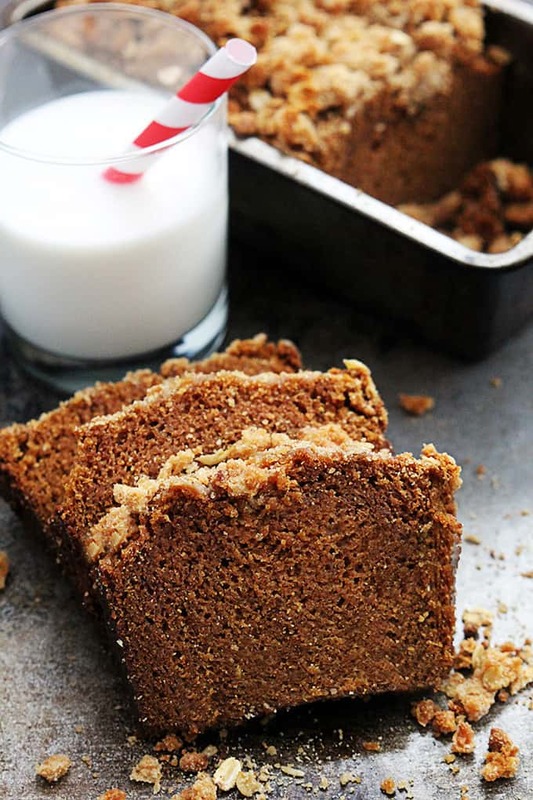 Ooooh this looks like some bomb pumpkin bread!! 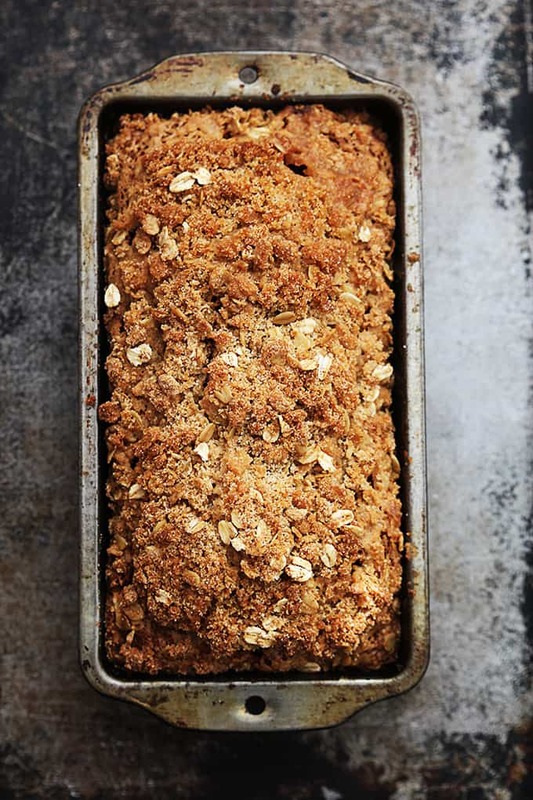 That streusel looks so yummy, and the bread looks so moist and flavorful. Pinned! I made this recipe and my husband LOOOOOOVED it!! Thanks so much for the recipe! Love your blog!! I’ve made cupcakes with your recipe and they were moist and yummy. Thank you for sharing. Good to know these come out well as cupcakes/muffins! This is so bright and fresh, I love it! Thanks for all your awesome recipe Tiffany. 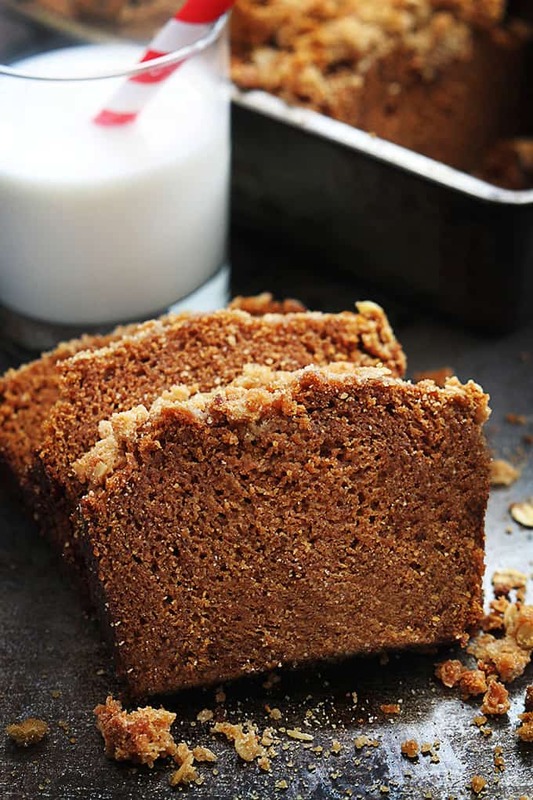 Does this recipe make one or two loaves of pumpkin bread? Hi Ashley, it makes one 9×5 loaf! Absolutely delicious! I had a little trouble getting it to cook through. I cooked it longer than 65 min until a toothpick came out clean but then it was a little overdone on the edges and the crumb topping was spilling everywhere. But still a winner!!! I’m not sure what I did wrong, but the bread took so long to cook all the way through without a doughy center that the bottom burned. It took over 90 minutes at 350. My oven is functioning fine. Maybe there was too much batter for one loaf? It has been so cold and fall like I felt like making something pumpkin. I made this Sunday and brought it to work Monday. It was Wiped Out in no time. Some of the comments were so funny they said it was SUPREME AND AMAZING AN OVER THE TOP GAME CHANGER. Will you marry me? LOL I will definitely be checking out ALL of the recipes on this page. Hahaha! Oh man, coworkers really do give the best feedback on recipes! So glad you loved this, I hope you find lots more to enjoy on my site!! Took way. More than 60-65 minutes to cook! To the point it was almost burnt! And my oven is fine. I am made this for my family for breakfast. It was delicious and it was eaten all in one sitting. I cannot get this bread to cook! It’s been in the oven for well over an hour and the inside is goo but the streusel is over-cooked! I am trying to salvage the bread, have the top covered with foil. What a huge disappointment. I just tried this recipe & it turned out SO GOOD!!! My whole family (including a very picky 7 yo boy) gobbled it down and LOVED it!!! This recipe will definitely be added to the mix! I’m making this right now and it’s taking waaaay longer than 65 min to bake. The center is still very doughy and I’m going on 95 min! And my oven is fine.